How do we communicate our faith; our following of Jesus? 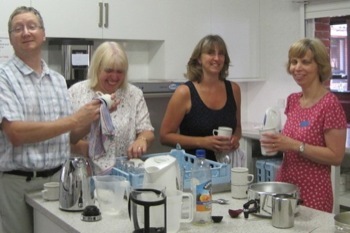 How do we do it in the Dovetail Centre, a room where both church and community meet? Art is one way that has been talked about during the refurbishment project. My vision has been for a ‘work of art’ that evokes conversation about who we are as a church and what we believe. I don’t want a Michelangelo – too expensive and too ‘churchy’! So, something more contemporary and subtle. Recently, Barbara Lowe and I met with the Rev David Hollingsworth. David is a Methodist minister near Christchurch and an accomplished artist. David ‘paints’ in Christchurch market as part of his ministry – he has had hundreds of conversations about his faith whilst painting with the public. His energy for transformation in human life through Jesus is infectious. David has produced art for such establishments as schools, prisons and community centres. His passion is not to paint a ‘masterpiece’ to hang on the wall for ever, but to work with a group to help the community produce a temporary piece of art … after some time, change it, before it becomes ‘wallpaper’. Here’s his idea … over the next few months, we collect ‘signatures’ of worshippers, visitors at Christmas, Dovetail Centre users, mums at Dovetots, children at Peter Pan, BB/GB members, Street Pastors etc. etc. The signatures are collected on special paper with charcoal – (available soon from the Dovetail Centre). Then, at a day led by David – open to all – these ‘signatures’ become a large piece of ‘art’, producing a dove! Intrigued? So am I! Want to get involved? Our first job is to collect the ‘signatures’ and that’s where you can help. Collect from anyone – your youth group / house fellowship and don’t forget our housebound friends. The very young and very old can all contribute. 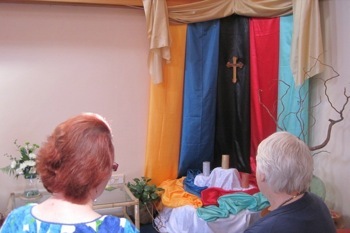 Everyone should be included in this ‘work of art’; a talking point in the Dovetail Centre to communicate our faith.